Is it the fact they go back to the beginning of time? Or is it the fascinating forms that nature seems to shape them into? Stones, rocks, mountains, glaciers, have always held a fascination for humankind. We see faces and animals in their curves, but also nightmares in their silhouettes. So is it any wonder that legends and myths have grown up around stones? But myths are not the only tales surrounding stones. Paranormal activity is also prevalent - perhaps due mainly to the 'stone-tape' theory? 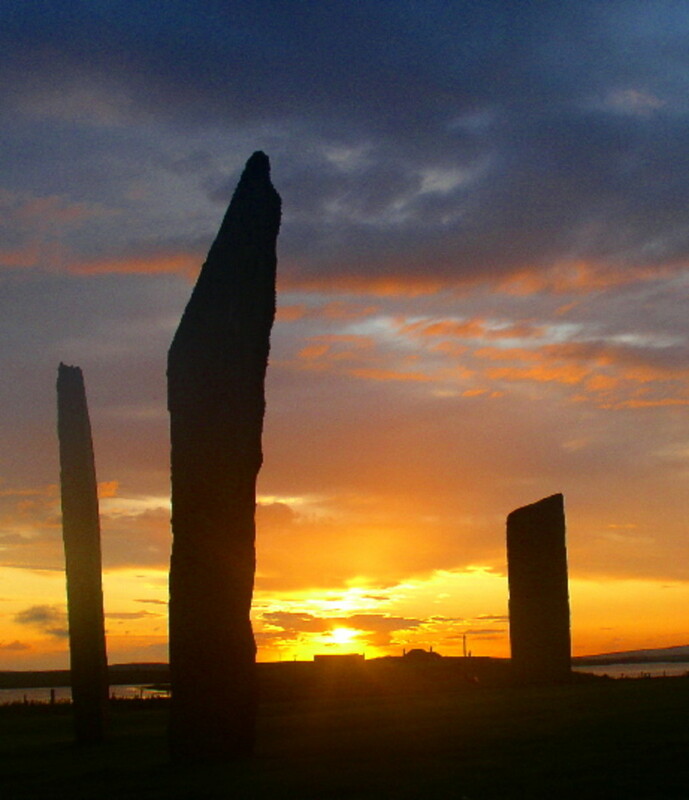 The history and activity surrounding many of the stones found in Scotland, gives an insight into the supernatural and mythical lore that are centuries old. There is a very old belief that once you have been to the Isle of Skye, some strange force never allows you to be completely free. This could just be the majestic beauty capturing hearts and minds - or is it a netherworld influence? For sure, the Isle of Skye doesn't have many places that are myth free from the sidhe (fairies), demons or spirits. 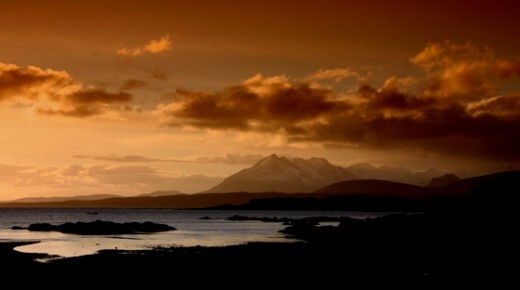 This makes Skye not only one of the most beautiful places on earth, but one of the most magical. Even sceptics have been known to leave the island with a thoughtful look on their face. - 'sk' - cloud; 'ye' - island. Due to its geographical shape, Skye has also been called the 'winged isle'. One of the most awesome rocks on the island is 'The Old Man of Storr'. This rock pinacle is 2,385 feet and sits proudly on Trotternish Ridge. The first ascent of the rock was in 1955. Naturally there are many legends surrounding this majestic landmark. The most popular is that the Isle of Skye was once over run by giant beings. 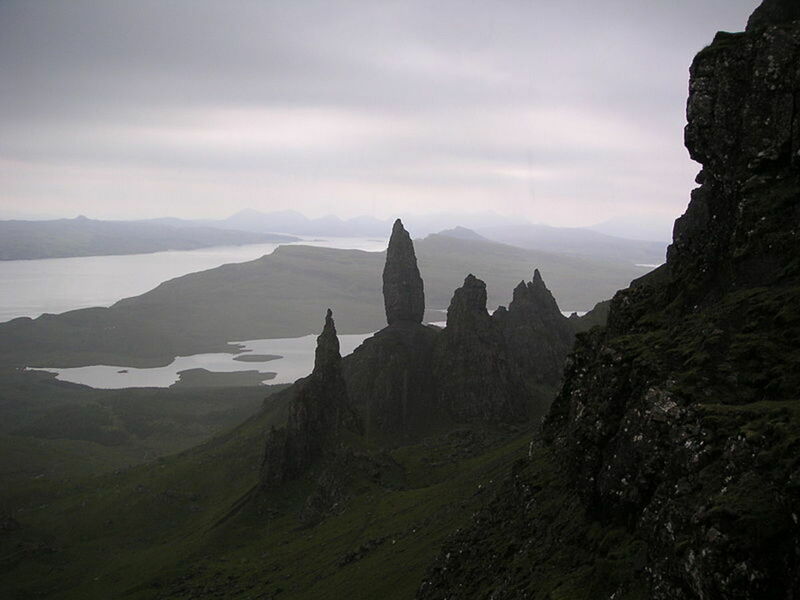 The old man of Storr is one of these beings, who was buried with earth when he died, but his thumb was left sticking out. The other popular legend is that the old man of Storr, along with his wife, were fleeing from the giants when they made the mistake of turning round to look at them - they were both turned to stone. There was another rock thought to be the old man's 'wife' but it toppled over many years ago. Skye also has it's fair share of hauntings especially around the old castles found on the island. But more mysterious beings are said to haunt and hide among the ruins and ancient stones. Glaistigs or gruagach is a fairy like creature who is normally female and very beautiful. She tends to have the upper body of a woman but the lower half of a goat. The glaistigs can play two roles. The less benevolent side is her form as the wailing washer woman seen when death occurs. The more common name for the washer woman is bean sidhe or by the Irish name, banshee. Her better side is viewed as being a helper with animals, especially to herd cows and to help with a good yield of milk. 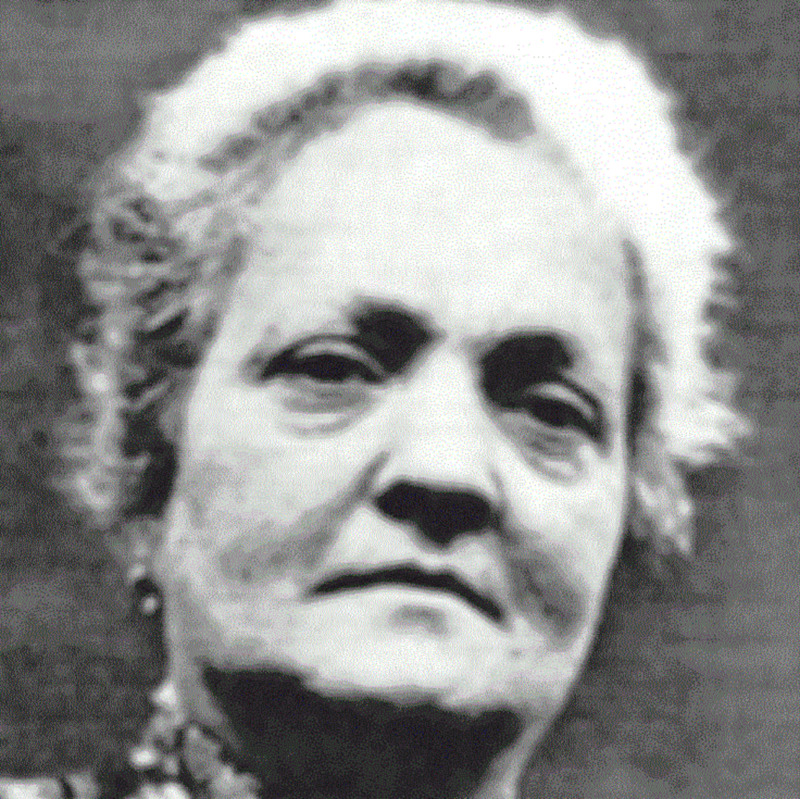 She was also believed to have been kind and friendly to children. Completely different to the glaistig is another supernatural being - a shape-shifting demon. The 'baisd bheulach' is a demon who is said to haunt the rocky area around the Odail Pass. Usually heard rather than seen, people have been terrified by its horrific howls and shrieks - heard in the dead of night. When it has been seen it was described as taking the form of a man or beast and sometimes a greyhound dog running between large stones. Many of the ancient stones found around Scotland are reported to have a number of ghosts and other paranormal phenomena associated with them. Like other ancient stones around the world, people have reported strange tingling sensations and claim to feel energy emanating from the stones. In addition there are numerous cases of observing and hearing other worldly figures. 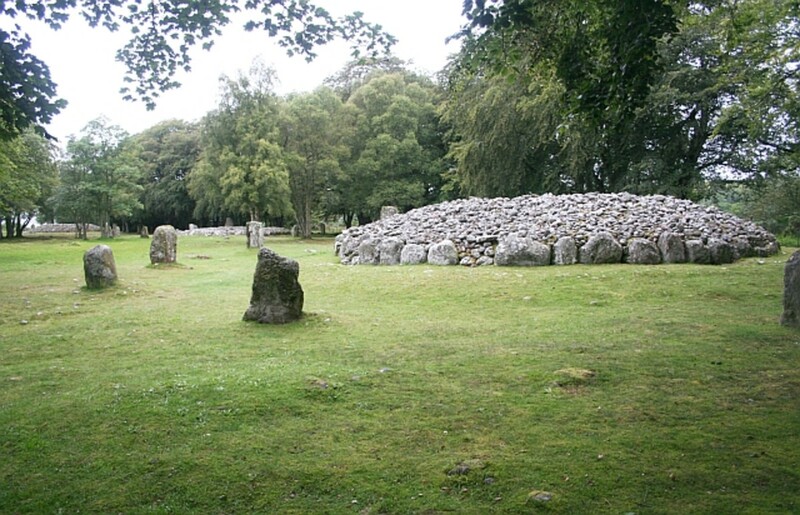 Clava Cairns (Highland). Stone Cairns - Not far from the bloody and haunting battlefield of Culloden lie some of othe Clava Cairns. There are 45 cairns in total. There are three buriel cairns at Balnuaran, Invernesshire. These three are part of a line of seven. They date to prehistoric times and referred to as 'passage grave cairns'. What makes them more unique is the circle of standing stones that enclose each cairn. In the area of the cairns, sounds of haunting music has been heard when no one is around. The musical instruments are said to be fiddles. Legend states that they are played by fairies. Others believe they are human musicians from times gone by. The stones also seem to have a curse attached to them. Many people who have removed stones from the site as keep sakes, have returned them within a short period of time, claiming that they have had bad luck since taking the stones home. On returning the stones, their luck seems to turn for the better. 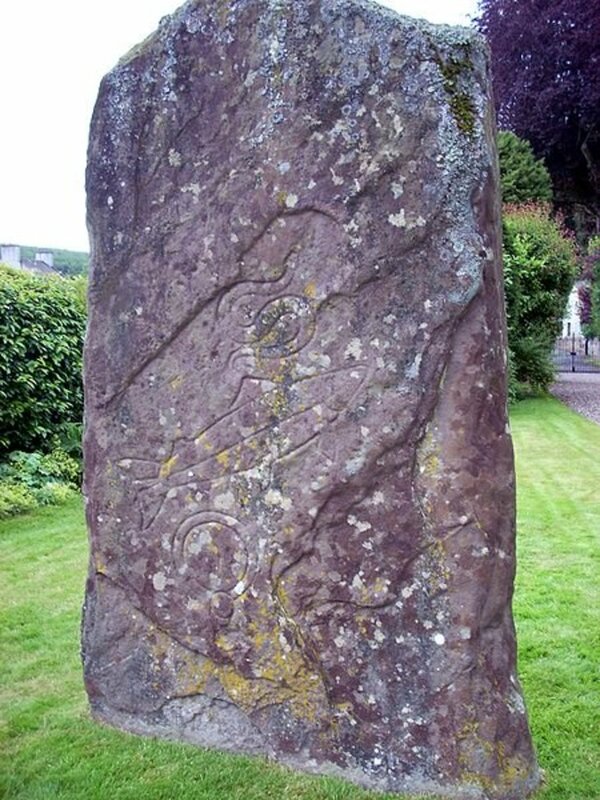 King Malcolm's stone, Glamis Village, Nr Glamis Castle. - It is believed that King Malcolm II of Scotland was murdered on the site of Glamis Castle in 1034. 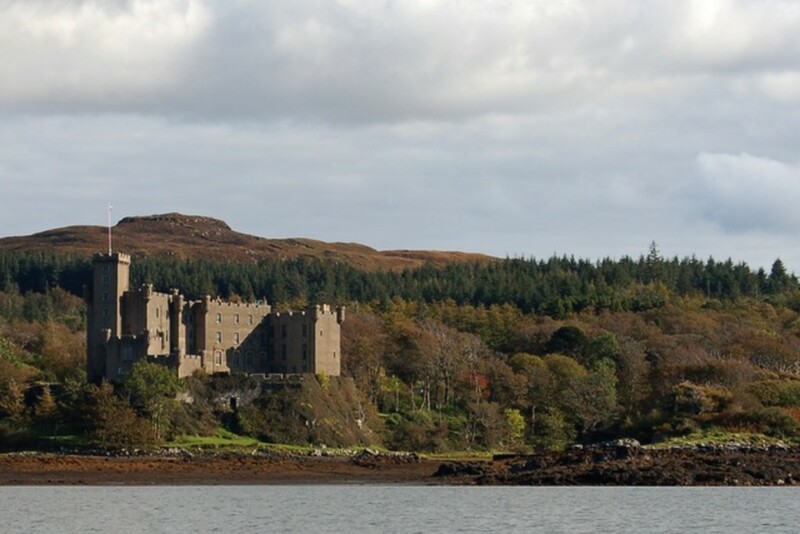 The castle wasn't built until about the 14th century, but it's believed a royal hunting lodge was here. Nearby is an old Pictish carved stone with an early Christian Cross on the other side. This is believed to mark the spot where the king was buried. Near to the stone people have claimed to have witnessed a large, grey figure of a man. The figure has also been seen in other areas but mostly around this intriguing stone. There is speculation if this is the ghost of King Malcolm or another spirit? 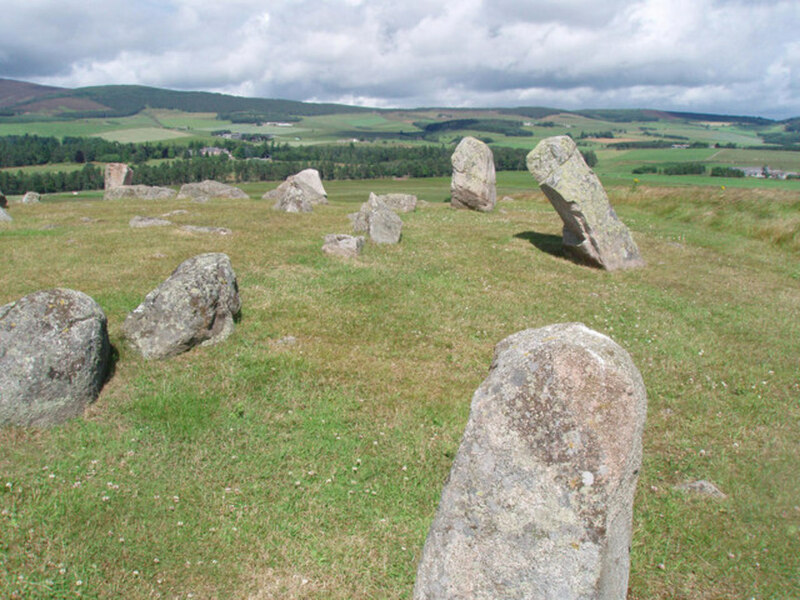 Tomnaverie Stone Circle, Tarlan, Aberdeenshire. Hooded Figure - around these mysterious and beautiful stones, people have reported mysteries energies and shapes. Perhaps it's earth energies or some other force that attracts one of the ghosts that have been reported at this site. The figure is always hooded, cloaked and silent. Appearing as from nowhere it disappears just as quickly. No one seems to know if it's male or female and because of the dark, bland clothing, it's not possible to place this apparition within a period of time. 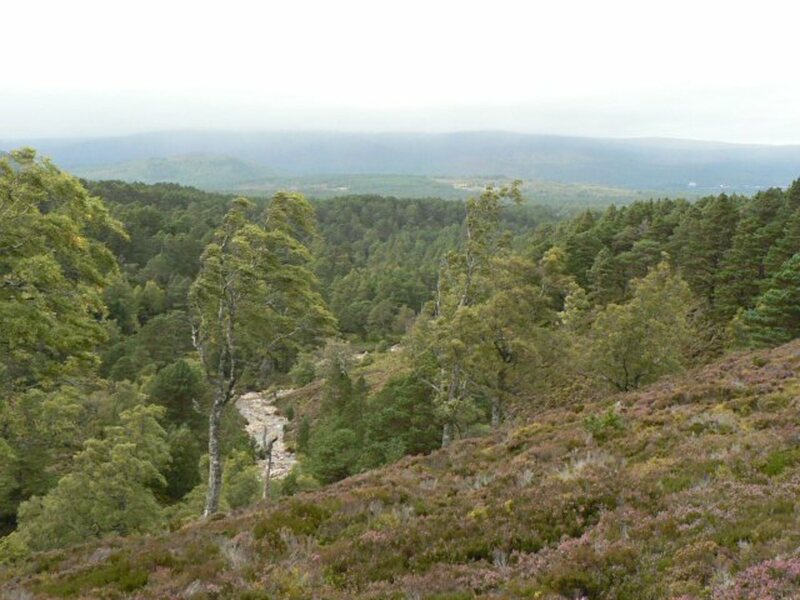 The Forest of Rothiemurchus, Invernesshire. Seath Mor Sgor Fhiaclach - Chief of Clan Shaw - tomb site haunting. Seath Mor, a warrior from the 14th century was a frightening sight in his own time, but would be just as awesome today. Not only was it his height that made him look intimidating, but he is also reputed to have had a crooked grin that only added to his alarming presence. The tomb of this mighty warrior lies in a secluded area of the ancient forest of Rothiemurcus. Seath Mor has been seen on numuerous occasions by many different people in the area of his tomb - a large ancient stone covered by five circular stones. The warrior will challenge anyone to battle, if they accept he disappears but any cowards, so legend says, are destined never to be seen again. It's also advised to keep a safe distance from the tomb due to another entity being present. This entity is the guardian spirit of the tomb. It takes the form of Bodach an Duin - an elf-like spirit who has a terrible temper. In the 19th century a walker passing the area is said to have thrown one of the circular tomb stones into the River Spey. The next day locals found that the stone had been replaced, but the walker was found dead in the river. These stones are still impressive today. But the original stone circle of 12 must have been majestic indeed. 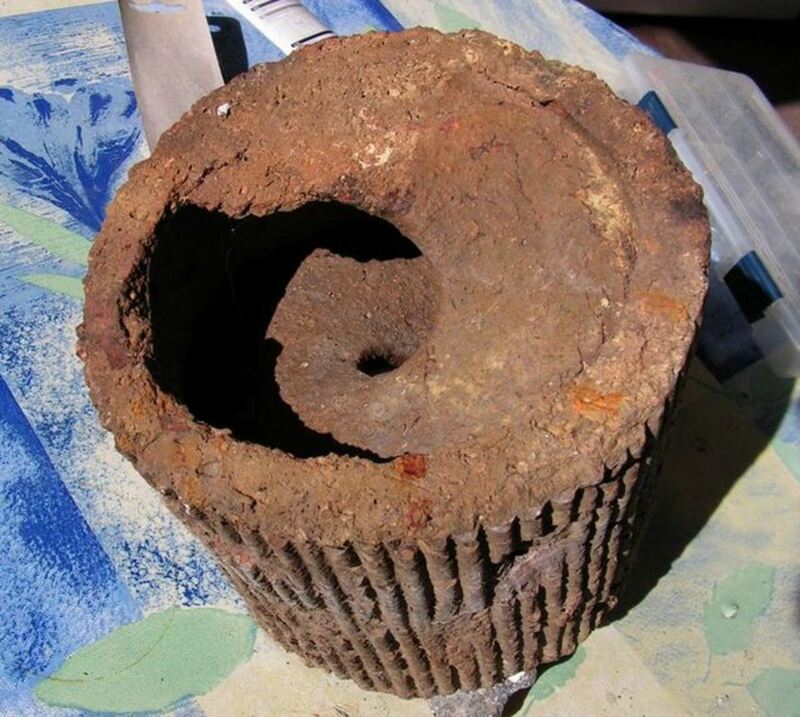 The circle is about 5,000 years old, but as yet no firm conclusions have been reached for its actual purpose. What is known, is that up until at least the last century the stones were thought to have healing properties. 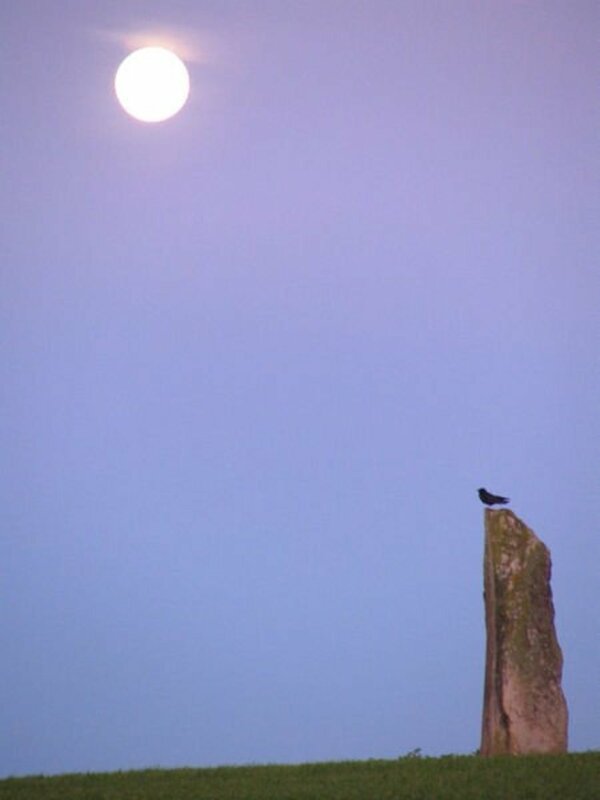 The most powerful stone was one called the Odin Stone. This was special as it had a central hole - these stones were always believed to be more powerful than any others. Newborn babies would be passed through this aperture in the stone in order to ensure that they would have good health. Many people with ailments of various kinds would also visit the stones in the hope of getting some form of healing. So important was the site that marriages and other contracts made here were deemed to be as binding as any made by a signed document. 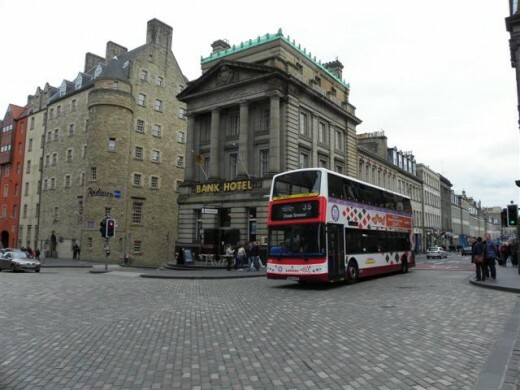 The Edinburgh vaults were created in 1788 due to the construction of the South Bridge. The bridge and vaults were built on parts of the old city. This itself sat on ancient grounds - Castle Rock and Arthur's Seat are two extinct volcanoes. 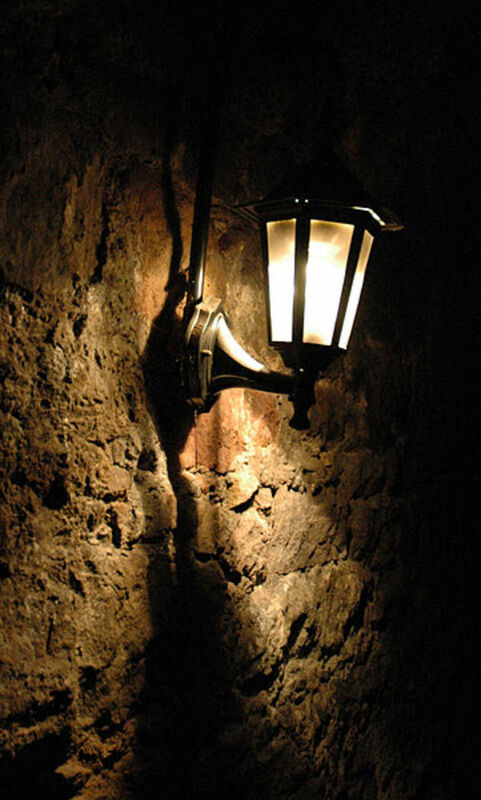 Since the Edinburgh vaults opened to the public the amount of paranormal phenomena experienced and captured on photographs, video and EVP's (Electronic Voice Phenomena) as well as personal experiences is phenomenal! There is no doubt that something very odd happens deep underground in Scotland's capital city. One area of the vaults has a stone circle within one of the chambers. This area was set up by a group of Wiccans in order to carry out their rituals. Not long after occupying this vault, strange phenomena started to occur both in and outside the stone circle. The Wiccan group believed that a distressed spirit might be the cause. The leader of the group held an all night vigil in the hope of placating the spirit and using healing energy within the space. But after experiencing severe scratch marks all over his body and an overwhelming sensation of discomfort, he left. He felt that he had been fighting with something powerful and much stronger than his own capabilities. Today the Wiccan group have use of another stone vault not that far away from the original room and have had no further problems. This vault is said to have been the area where 16 prostitutes were murdered nearly two hundred years ago. 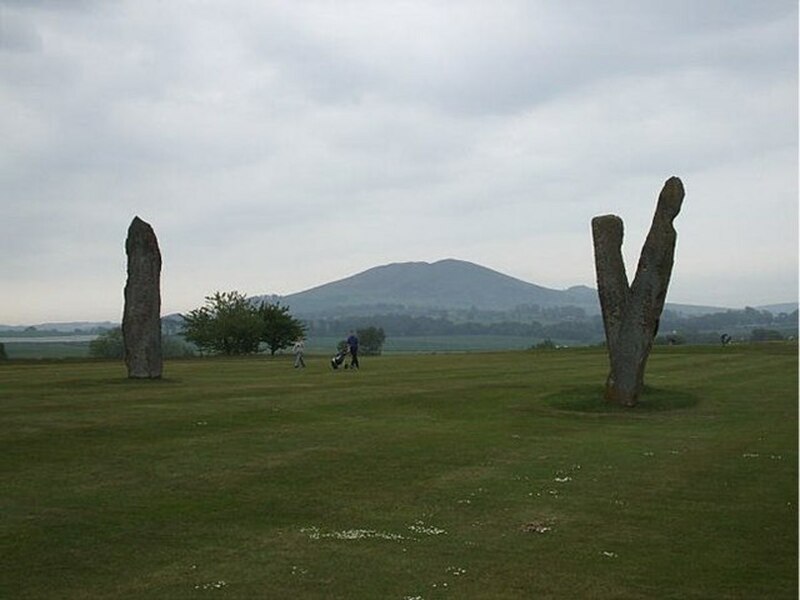 Due to the negative energy many feel that the vault with the stone circle is home to a demon. But other theories have also been put forward. A few years ago the phenomenal ghost hunting programme 'Most Haunted' carried out a live show that included an investigation of the stone circle vault. One member of the crew was attacked and deep scratches were discovered all down his back. The show's medium at the time - David Wells - felt that the spirit was not demonic, but his feelings were of a very ancient spirit of the land that was guarding the area. Whatever the entity is that manifests within the stone vault and around the stone circle it obviously does not like people in it's space. So if you visit, you have been warned! Although stones, hills and mountains hold a fascination for us, we are always inclined to treat them as dead and cold objects. But are they? Is there something, natural or otherwise, within stones that attract certain phenomena or entities? Do they in fact have the power to heal? The next time you pass by a stone, boulder, hill or mountain, stop to think about what hidden forces might dwell within. You never know what energy may present itself or who you might meet? Your welcome Barbs! It's always a pleasure to speak to another dog lover as well. Good luck with the pet parade contest!!! @Seeker7...Gee-willigers! -- I double-clutched that entry! Sorry for the repeat, but I certainly appreciated you responding twice! Ebony pretty much always enjoyed herself, so I'm glad that attitude comes off to observers of the aforementioned picture! We'll go with the hug! She was a great hugger, too! :) Yes, it's terrible to lose them, but like anything else we humans cherish, the memory is forever. I adopted another companion about two years later, but I don't have a picture of the two of us together. She's a cute little Border Terrier, a lap-nap type some 100 pounds lighter than Eb, and she dislikes the water intensely. So different, but just as lovable and the sweetest little face. Well, on I go, like they're my children! Ha! I do have two children, but they aren't as adorable! LOL! Nice to chat with another canine lover! Thanks!! Hi Barbs - it's always sad when our pets finally go. I know, I've had a few dogs over the years and I still miss every single one of them. But I reckon the joy and happiness they give when they are with us, is definitely worth the heartache when they are gone. LOL! Yes, as I said in my last comment - it looks like your giving her a big hug - she is absolutely adorable and looks like she is enjoying herself!! Hi Barbsbitsnpieces LOL! No it doesn't look like you are choking her, it looks like your giving her a lovely hug! She is a beauty!! @Seeker7...Thanks for your mention of my Newfoundland, Ebony. She was a sweetheart and a special friend. I had her for over 11 years before she passed away in January of 2009. This is one of my favorite pet pictures, and I frequently use it. So, hopefully, your comment means it DOESN'T look like I'm choking her!? :) With her tongue hanging way out and my hand at her throat, that was the first thing I thought when I got this picture back from the professional photographer! Still, I like it, too! @Seeker7...Thanks for the mention of my Newfoundland female, Ebony. So I guess this picture DOESN'T look like I'm choking her!? :) With her tongue handing way out and my hand at her throat, that was my first impression when I got this picture back from a professional photographer! I like it, too, though! 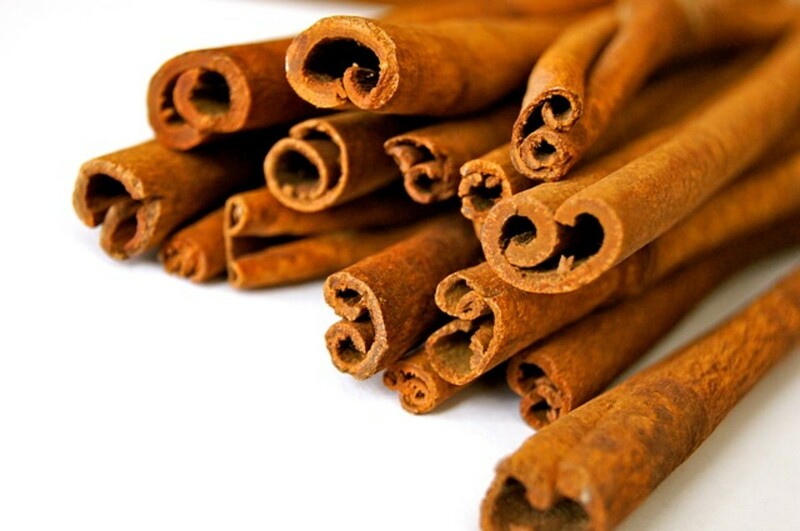 Hi Barsbitsnpieces - many thanks for stopping by and glad that you enjoyed the hub!! Ps - your dog is awesome! What a lvoely face!! @Seeker7...More fascination!! This Hub is thrilling! Thanks for sharing the land of Scotland! Hi toknowinfo - hey! Many thanks for stopping by and glad that you enjoyed the hub! This subject was a surprise to me as well - I had no idea just how much history and beliefs surrounded these beautiful natural objects. Fascinating, fascinating hub. You always manage to teach me about new things. As always, well written and informative. Voted up, awesome, interesting, informative, and useful. Hi Lilleyth many thanks for stopping by and leaving such a lovely comment. I have never read 'Dragonfly' but it sounds fascinating - I'll need to look this one up! Beautiful! Would love to visit all these places some day. I've been fascinated with magic stones ever since I read Dragonfly in Amber by Diana Gabaldon and how a present-day woman steps near a stone and vanishes into the past. Hi Alicia, many thanks for stopping by and for leaving such a lovely comment. I hope you do manage to visit Scotland one day I think your journey would be a very interesting, and maybe even spooky, one! LOL! Hi TLW - as usual, always a great pleasure to hear from you. Glad that you enjoyed the hub! I think the paranormal is one of those subjects that the more you learn the more you want to learn! I think as well, that the more you do learn the more questions are raised - I think that's what keeps my enthusiasm going! Lovely to hear from you again and many thanks for the votes up - greatly appreciated! Hi Kashmir56 many thanks for stopping by and glad that you enjoyed the hub. Thanks to for the vote up - greatly appreciated! This is a very interesting hub, Seeker7, and the photographs were beautiful - especially the first one, which was very impressive! I enjoy reading about paranormal phenomena, and I would love to visit Scotland and see some of the places that you mention. Thank you for the fascinating information. Voted up and all across but funny. Awesome, awesome article Seeker7! Very interesting read my friend. Love all your paranormal articles. 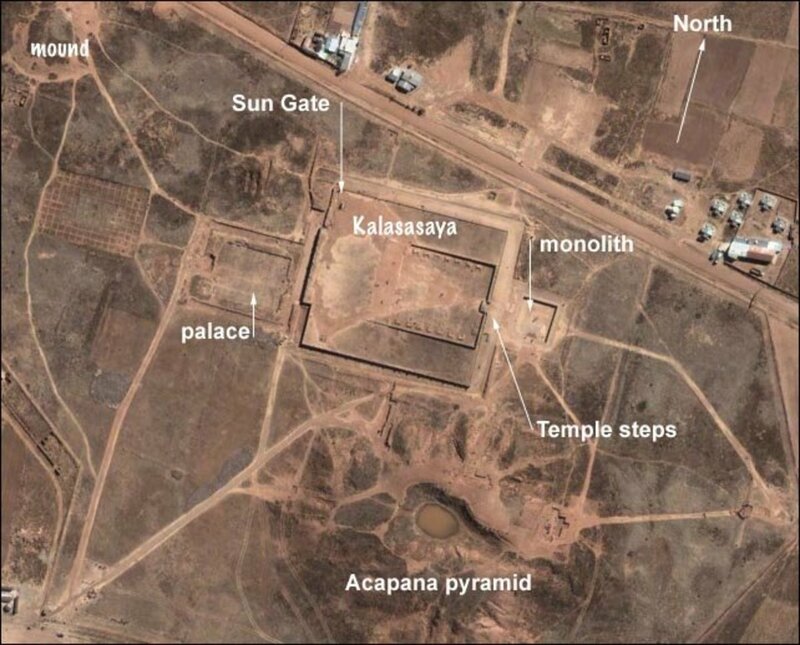 We have all this history associated with different places, it is no wonder that events like these happen. I am a believer and it is interesting learning more and more about the paranormal realm. Awesome job. A very well written hub with very interesting and fascinating facts about all these stones which was illustrated with many great pictures ! Hello b.Malin, many thanks for stopping by and glad that you enjoyed the hub and the photos. I look forward to reading many more of your hubs as well. Seeker, this was such a Wonderful, and Informative Hub to read and Enjoy! Such Fascinating Facts...as well as your Pictures to look at. Thanks so much for sharing your knowledge. I look forward to Following your Hubs. Hi Rosemay always lovely to hear from you and to get your own stories from places that youi've visited. I've never managed to get to Mull yet, I've passed by it quite closely and it looks stunning. It'still on my list of places to visit. The washer woman and Ewan is fascinating! I love to hear all these different stories from different places. I think if you ever get to the vaults Rosemay, you would definitely enjoy them even although they are creepy - who knows you might even meet the infamous 'Mr Boots'? LOL! Only kidding! I wouldn't wish that nasty piece of work on anyone. Many thanks again Rosemay for your lovely comment - as always it's much appreciated. I agree Kitty. I think 98% of the time if we go in with respect, a little love and an open mind, it's amazing what experiences will open up to you. You have my votes. You have written another fascinating and most interesting hub. Spent some time on the Isle of Mull where stories of the headless Ewan roams, and the story of the 'washer woman' when he asked her if he would win a battle she said if he was given butter without asking he would win the battle, unfortunately he wasn't served butter. Agreed! No, I think when spirits are labeled as "evil" automatically we're shutting out possibilities for learning and growth. Some spirits I do believe are ancient energies and have been around before we were even here...so it's only right that they're protective of some of their land. Thanks again! Hi Kitty - as always lovely to hear from you. Now that is really interesting about you tapping into the spirit that could well be an ancient one. David Wells, the psychic who used to be with Most Haunted, is one of the best I've ever seen. I think what I liked about him, apart from the incredible amount of 'hits' that he gets, and the fact that he is one of the nicest guys on the planet, is that not everything that is aggressive in spirit is automatically 'evil'. I think some psychics are paranoid and see every shadow as a demon or evil spirit just waiting to spring. 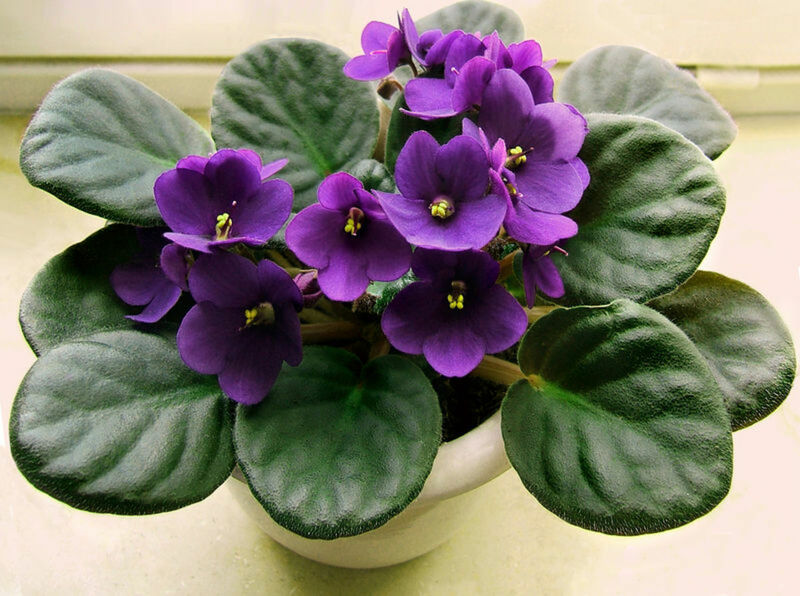 But to move on, many of the best psychics, the ones that are well balanced and tolerant of various beliefs, have independently come to the conclusion that the spirit within the vaults is very powerful, but it's also ancient and protective. Two psychics who were also Wiccan - different from the group that have a room there - also picked up on an ancient spirit that was protecting an area of land that had been built on over the centuries. So that was really interesting what you picked up on Kitty - here's hoping that folks will visit the place with a little respect for things that we don't fully understand. Certainly the members of 'Most Haunted' who did go with respect - David Wells, Yvette Fielding the presenter and parapsychologist Dr Kieran O'Keefe, were not harmed in anyway, despite the fact that they spent the longest amount of time in this particular area. I think that speaks for itself. Seeker - Again, spectacular hub my friend. Scotland sure is a beautiful and mysterious place, isn't it? I want to visit someday and spend at least a week seeing some of the things you've mentioned here, including the Isle of Skye as Alastar said. 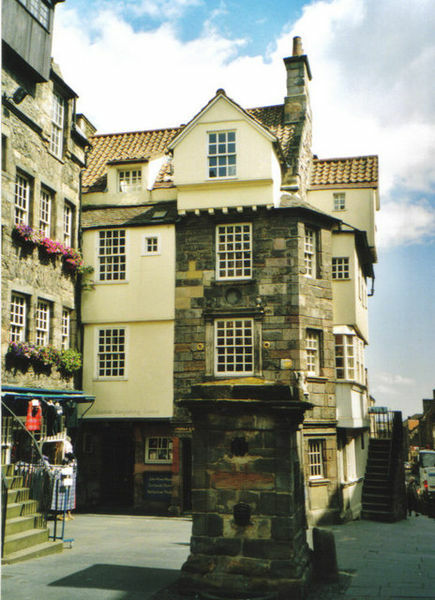 Funny thing about the spirit that you mentioned in the Edinburgh vaults is that as soon as you wrote about it I thought to myself that the spirit was an older one that was protective of that area...and then you said that the psychic believed the same thing. Pretty cool that I tapped into that. I can't wait to visit Scotland one day...and hopefully sooner rather than later. Thanks for sharing this with us. Another masterpiece by Seeker7. Hi Lesley, glad that you enjoyed the hub and the 'Old Man of Storr' - it is awesome and in reality it's even more so, it's actually gub-smacking! You can understand why giant legends come about when you look at awesome sites like this. 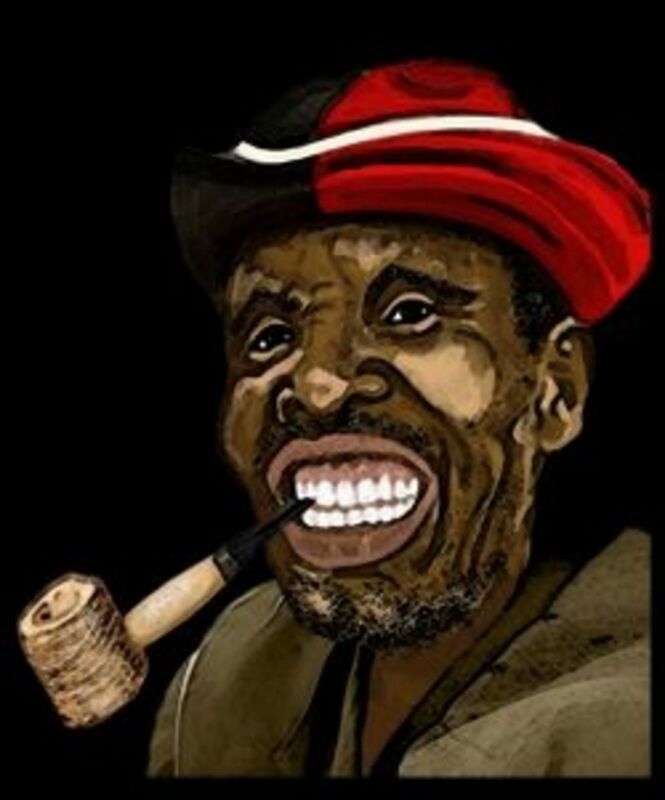 As to 'Mr Boots' - yes, he is very scary and has scared the crap apparently out of quite a few folks down in the vaults. It would be really interesting to find out one day just who this character was, but I guess that seems unlikely! Best wishes to you as well Lesley, have a great weekend. Hi alocsin, many thanks for stopping by and glad that you enjoyed the hub. Hope you enjoyed being at the Festival Fringe! I try to get over to Edinburgh at least a couple of times during the Festival and I love the mix of cultures and art that goes on, it's awesome! Hi Seeker7, The Old Man of Storr is awesome - wow that's huge! The mysteries and legends of these rocks is fascinating as is the spirit of Mr Boots - well he's just scary! I can't believe how I missed all these stones when I was in Scotland, even the ones in Edinburgh where I spent nearly a month at the Fringe Festival. I'll have to bookmark this list for next time. Voting this Up and Useful. Hi Rob, lovely to hear from you and thanks for stopping by. I'm glad that you enjoyed the hub and that perhaps it's helped you a little bit to experience Scotland's culture - even although it is weird and creepy at times! Hi Alastar, that's really interesting about this ghost having two spots - not unheard of, which makes me think they sometimes have an 'area' rather than a small space that they wander around in. That's a really interesting tradition as well about 'tossing the coin', that's a new one for me. Usually 'coins' are used as a tribute rather than to show contempt for someone, but that's what makes all these traditions so interesting, is there diversity. I hadn't heard about a new movie re: Mr Burke and Mr Hare? I'm always keen to a get another viewpoint on the murders committed by these two nasties! I think they are evil, no doubt, but their story is also so creepy and fascinating, that I think it will be a while yet before folks get bored with the story. I know at the Edinburgh Festival every year, you can bet there will be at least one event focused on Burke and Hare and these events are always huge crowd pullers. Alastar, many thanks for the info - greatly appreciated. Hi seeker; Very interesting and informative. Since my family came from Scotland, I'm very interested in the culture and nature there which I haven't had much chance to experience. Ah thanks for such an awesome reply Seeker. Ferguson's challege is the only one I'm aware of like that off-hand. There are two 'spots' for him in the park: one where he was shot off his horse by a gadzillion bullets, and where his ghost is said to appear, and the burial cairn where the tradition is to toss a stone in contempt onto it as one passes by. Also, did you know there's a major movie coming out soon called Burke and Hare about those two. Hi Gypsy lovely to hear from you as always. Glad that you enjoyed the hub and the pics! I'm sure that the ghosts of Scotland will be very glad to see you - they usually are interested in any visitors. Many thanks again for stopping by, it's always a pleasure to hear from you. Hi Alastar - the 'Old Man of Storr' is quite a site, once seen never forgotten. I've been to Skye three times and I never get tired of the place or it's history. I honestly think you would love the place and would feel quite at home. To my knowledge, there's no archaeology/anthropology results that show Skye or any of the islands had giants. However, there's a couple of theories that the giants referred to might indeed be a race memory, but no remains, even the bone have survived. Or the use of the word 'giant' could be a way to show reverence for the ancestors - describing them as 'giant' in bravery, deeds or whatever, rather than the word relating to their physical size. The interesting thing about most of Scotland is that unusual stones are either associated with giants or they are associated with the devil! So I wonder if this is just a form of making sense out of the environment, rather than a race memory? I'm not sure, but it's an interesting thing to ponder over when you can't get to sleep at night! That is really fascinating about you spirit at Kings Mt. I wonder if this is just a Scottish thing - spooks challenging people - or if there are more stories like this? If you hear of anymore from your part of the world, maybe you could let me know Alastar, as I find this really interesting. As to the creepy vaults. Well I really enjoyed going there and would definitely visit them again. But the atmosphere is weird. 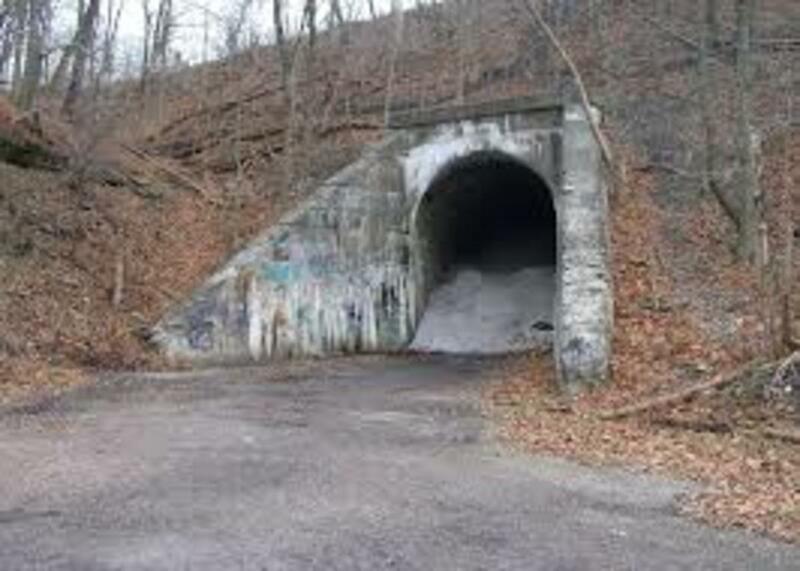 Now this could be because the vaults are well below ground and the air is always a bit iffy in these places. But you do get a feeling that it's more than the air. I think there's a lot of residual energy down there - not surprising given the amount of homes and shops that were set up in the vaults - but there is definitely something more within the shadows. Of course when the guides tell you that the body snatchers Burke & Hare frequented the vaults and many other unsavoury characters, it's not surprising that a few poor spirits are left behind. When I was there I really wanted an encounter with the evil spirit, the infamous 'Mr Boots', but nothing happened in his vicinity of the vaults, so I was a wee bit disappointed, but it definitely didn't spoil my visit. Alastar, many thanks once again for your fascinating information and comments - I always look forward to reading them. Hi StellaSee, many thanks for stopping by and for your interesting comment. The vaults have been open since the 1990s, but I think the place has really taken off since the vaults have appeared on TV a few times. LOL! I know what you mean about being attacked! But I would honestly be more wary about another part of the vaults where there is an evil spirit called 'Mr Boots' - now this one has been heard, seen and it's attacked quite few people over the years including the guides - this spook is not protecting anything, he's just a nasty piece of work. As for the other spirits said to haunt the vaults, they are pretty harmless as far as I can make out. There is a couple of females, a cobbler and one or two wee children going around. That's a very interesting question about the fauns from Roman Mythology - I hadn't actually thought about it before. But there does seem to be some similarities - fauns/Glaistigs tend to be mischievous rather than bad and they do have a nice side to them. The drawings that I've seen of the Glaistings tend to show the bottom half as having only two goat-like legs, but the fauns seem to have a full lower body with four legs. If I find out anymore I will let you know. Many thanks again for your visit! Hi Parks - many thanks for stopping by and glad that you enjoyed the hub. Hope you manage to get in touch with your friend, it would be really interesting to know, if they are still around Edinburgh, if they have had any experiences in the vaults or elsewhere. Voted up and awesome! It all sounds so wonderful thanks so much for this great hub! Lovely pics! I'm very interested in the paranormal so now I know where I can perhaps meet some ghosts. 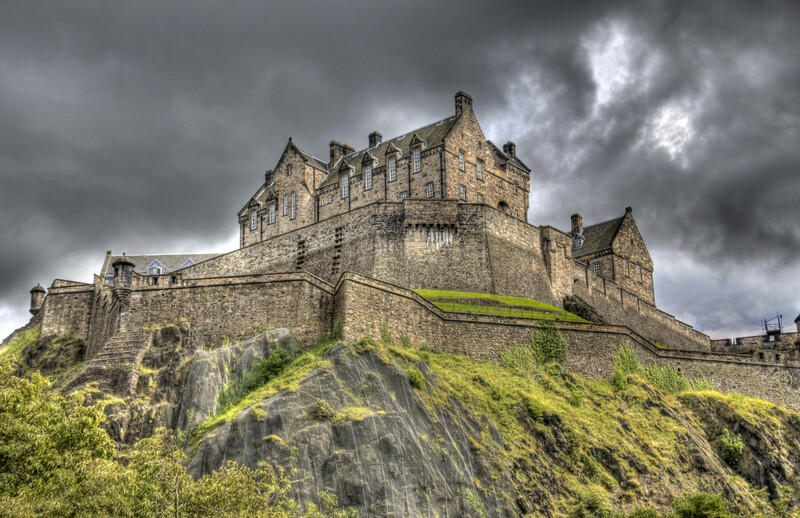 Gotta go see Scotland you got me longing to see it all. Passing this one on. 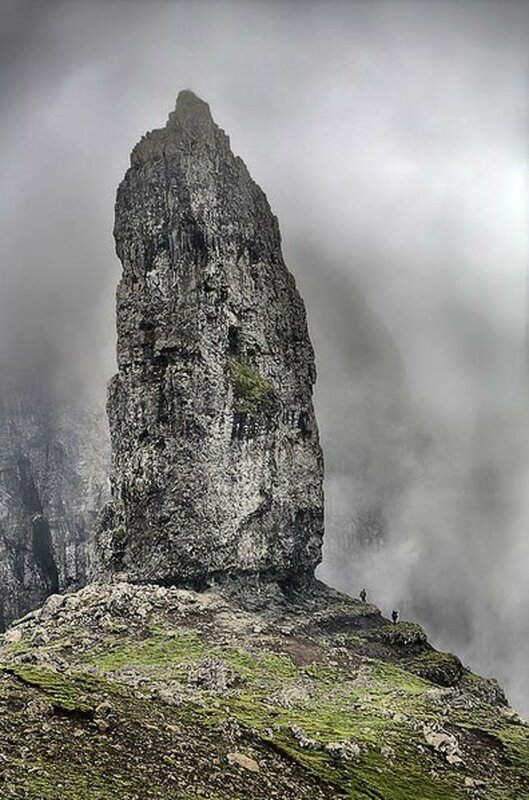 Oh wow Seeker, looked at the pic of The Old Man of Storr before reading the text and was trying to get a perspective on it's size; then i saw the little people down at the bottom and it is way taller than i thought. Is there any other kind of evidence at all on the island for extra large humans in the past? And the Glaistigs, Banshees, didn't know they could have two sides. Shape-shifter on the isle too. Isle of Skye would be on my itinerary for sure. Ancient stones- awesome interesting. The Rothiemurchus pic could have been taken over here in the foot-hills Seeker. We even have a similar legend to Seath Mor. On the anniversary of his death in battle the Scottish commander at Kings Mt is said to appear at his stone marker on the spot where he fell and challenge anyone there. Edinburgh- don't even get me talking. One day Seeker, one day I'm a be headed your way. Another marvelous Scots para one my friend! I studied abroad in Edinburgh but I've never heard of the vaults..maybe is was better that I didn't.. I'd have a heart attack if some spirit thing attacked me! 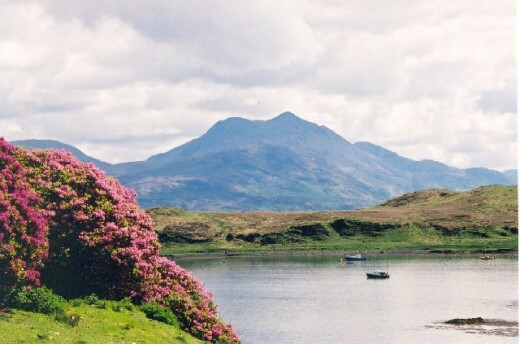 But I wish I had the opportunity to go to the Isle of Skye.. the photos I've seen of the place look so beautiful! One question: is the 'glaistigs' like a Scottish version of the fauns from Roman mythology? An extremely well written pictorial. Your article has compelled me to contact a childhood friend that has resided in Endinburgh since graduating from college in the 70s.